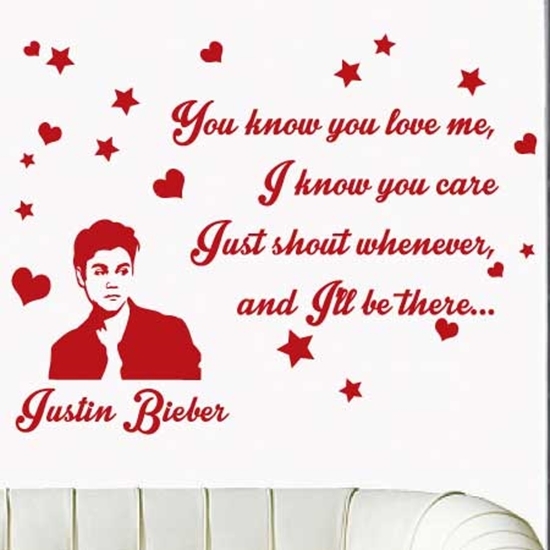 LARGE JUSTIN BIEBER Wall song lyrics Sticker "I Know you love me" Wall Sticker. - This design comes in pieces and can be laid out any way you like. Vinyl wall art is the hottest new trend in home decorating. Get the hand-painted/ stenciled look without any mess. This design comes in a range of colours to compliment any modern interior. Simply peel off the backing paper, apply graphic to your surface - easy!. All of our designs can be used on clean and smooth surfaces including painted walls, mirror, tiles, plastics, and wood. How do you apply Stickers Wall? What material are the stickers made of and how durable is it? All of our stickers are produced using high quality vinyls that will last over 5 years if used properly and untouched. Can Stickers Wall be removed? Yes, our stickers can be easily removed by simply peeling them off. But be more careful and peel slowly if you are peeling stickers that have been on a surface for a long period of time. Yes we do, for custom sizes please contact us at sales@stickerswall.com for more details and price quote. Can Stickers Wall be reused again? Once stuck the stickers can not be removed and used again. How do I remove any bubbles that may occur during application? During the application process some air may be trapped between the Vinyl and the surface creating tiny bubbles, to get rid of this simply use a pin to prick the bubble. Be creative! This design comes in pieces and can be laid out any way you like.